Long Beach, California (known as the "LBC" by locals) is a city of about half a million people in Los Angeles (LA) County, directly south of Downtown LA. Long Beach is best known for its urban waterfront attractions, like the Queen Mary and the Aquarium of the Pacific, but despite being the sixth largest city in California, it has a small-town, provincial feel, with bike-friendly streets, active neighborhood associations, and artist collectives. Long Beach has more music and cultural festivals every year than anywhere else in Southern California. Its thriving dining and entertainment scene includes famed dive bars and live music venues that have launched a number of notable bands. The city also hosts the annual Toyota Grand Prix of Long Beach that turns downtown streets into a race course every April. The Queen Mary is a luxury ocean liner that is now permanently docked in the LBC. The ship is rumored to be haunted and offers daily tours as well as nighttime ghost tours for those who aren't afraid of the dark. Overnight stays are available in the ship's staterooms, and packages that include breakfast, a tour, or a Catalina Island excursion are also bookable. Even if you're not staying overnight, you can still drink and dine on board at Sir Winston's lounge, the Chelsea Chowder House, or the observation bar. The Aquarium of the Pacific is located on Rainbow Harbor in Downtown Long Beach and has over 12,000 pacific coast creatures including penguins, sea otters, puffins, sea lions, and seals. The lorikeet forest is a very popular exhibit, and guests are given the chance to feed the cute, colorful birds. Visitors also have the opportunity to touch a moon jelly, stingray, or a nurse shark, if you dare. 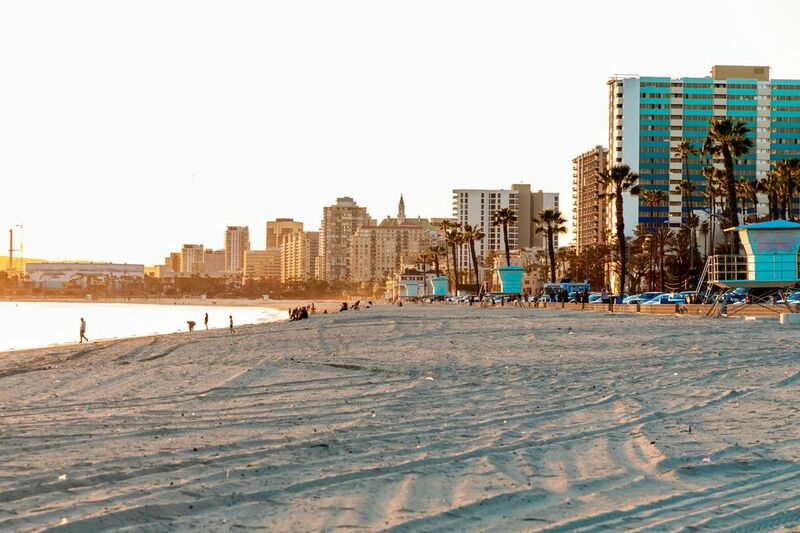 The beaches in Long Beach offer a variety of activities like biking, skating, and kiteboarding. However, since the beaches are sheltered by a breakwater, there are no large waves—so don't expect to hang ten here. While this is disappointing for surfers, the calm water makes LBC's beaches popular for families or beginner swimmers. If you want to enjoy the beauty of the Pacific Ocean without getting sandy, a visit to the grassy Bluff Park is a must-do. The bluff's paved sidewalk makes it a favorite spot for romantic sunset walks and picnics that can be enjoyed on the green. Shoreline Village's boardwalk is dotted with funky shops, family-friendly attractions, restaurants, and bars, all along the Shoreline Marina. There is a carousel, an arcade, and rentals for powerboats, Jet skis, electric boats, kayaks, sailboats, and more can be arranged right from the marina. The village also hosts live music on most summer weekends and during the Christmas season. Wheel Fun Rentals offers surreys, pedal karts, bikes, tandems, tag-a-longs, and strollers at Shoreline Village and stand-up paddle boards at Rainbow Harbor Dock 10. You can also book a Segway tour around the Shoreline Marina and Rainbow Harbor area, as well as an extended tour that goes past the Queen Mary. A wide variety of boat tours and harbor cruises depart from Long Beach, but the whale-watching tours are the most popular with visitors. Depending on the time of year, you may be able to see any of the following whale species: Gray, blue, fin, humpback, minke, or killer whales (orcas). Many other creatures are also commonly spotted while searching for whales and can include common, bottlenose, Risso's, or Pacific white-sided dolphins, stingrays, and pinnipeds. Naples Island is comprised of three islands in Alamitos Bay in Long Beach. When most people talk about visiting Naples Island, they are referring to the inner island, which is accessible by car. The island has a walkway that takes visitors past million-dollar mansions, picturesque bridges, and grand yachts, creating a beautiful setting for a sunset walk. During the Christmas season, visitors flock to the island to see the decorated houses along the water and take in the festive boat parade that goes past the outer and inner islands. Gondola Getaway offers the most authentic gondola rides outside of Venice, Italy. With tours on Alamitos Bay and through the canals around Naples Island, you can choose to savor the experience of a relaxing ride​ or add a dash of romance by booking a decadent brunch cruise served with bellinis. Visit the only museum in the United States dedicated to contemporary Latin American art. The Museum of Latin American Art (MOLAA) has an outstanding collection of modern paintings and a permanent collection of sculptures displayed in the museum's courtyard garden. Every beach town has a main drag, and in Long Beach, that's Second Street in Belmont Shore. This vibrant stretch is lined with sidewalk cafes, restaurants, and small boutiques overlooking the beach. Belmont Shore hosts a number of events throughout the year including a chocolate festival, a sidewalk chalk art festival, a pre-Grand Prix event, the Haute Dog Howl'oween Pet Parade, and a Christmas Parade. Retro Row gets its name from the many thrift shops packed into just a few blocks. Hollywood costume and set designers are known to raid these shops to outfit movies and TV shows, so the vintage items sold here are of the highest quality. You can't climb the lighthouse in Lighthouse Park (also known as ShoreLine Aquatic Park), but this tiny peninsula jutting into Rainbow Harbor is a popular place for skateboarding, checking out the view of the Queen Mary and Rainbow Harbor, and picnicking. This park is one of the best viewing areas for the Queen Mary's Independence Day fireworks show, so every year the park fills with people beginning at sunset. Rancho Los Alamitos is located near California State University, Long Beach and is the last remaining corner of a Spanish land grant given in 1784. Today, it serves as a living history museum that includes six agricultural buildings, a working blacksmith shop, adobe ranch, an exhibit center, gift shop, and gardens. Built in 1844, Rancho Los Cerritos is one of the last remaining two-story adobe structures still in existence in Southern California and is now a museum. In the summertime, the ranch hosts free outdoor community concerts. The Long Beach Museum of Art is a bluff-top museum overlooking the beach. There are rotating exhibits as well as a permanent collection, and the on-site restaurant, Claire's, offers incredible ocean views. The museum has free admission on Thursday evenings and all day on Fridays. The Pacific Island Ethnic Art Museum is based on the personal collection of the late Robert Gumbiner, who also founded the Museum of Latin American Art. The museum showcases pieces from all of the Pacific Islands​ but focuses mainly on Micronesian arts. Pine Avenue is the hub of Downtown Long Beach dining and nightlife, with a plethora of mostly independent casual and fine dining restaurants, live music venues, and nightclubs. Pine Avenue hosts numerous special events and festivals throughout the year including Thunder Thursday, the opening ceremonies of the Long Beach Grand Prix, food festivals, and summer music events. There is no shortage of great live performances in Long Beach. Housed within the Long Beach Convention Center, the Long Beach Performing Arts Center encompasses the Terrace Theater, which hosts traveling Broadway musicals, concerts (including major children's productions), and the Center Theatre, home to the award-winning International City Theatre that hosts both plays and musicals. The Carpenter Performing Arts Center, which is located at California State University, Long Beach, is the home of Musical Theatre West and presents performances by their in-house musical theater company. Long Beach Playhouse is a community theater that lets locals shine on stage with high-quality performances presented throughout the year on the main stage or in one of the more intimate studio theaters. The East Village Arts District is an area of shops, galleries, and cafes in Downtown Long Beach. On the second Saturday of each month, the streets in the area are closed to traffic for an art walk that features multiple art vendors, gallery openings, and live musical entertainment. The Long Beach Navy Memorial, which is adjacent to Lighthouse Park, pays tribute to the city's naval past. Beginning in 1908, when President Theodore Roosevelt stationed 16 ships of the Great White Fleet in the port, Long Beach served as a naval town for over 100 years until the closing of the shipyard in 1997. The Memorial includes a flag mast from the Long Beach Naval Hospital, an anchor from a ship in the Great White Fleet, and a replica of the compass rose from the Naval Station Administration Building. The Pike Outlets at Rainbow Harbor is a shopping, dining, and entertainment complex across from the Long Beach Convention Center. In addition to outlet stores like Restoration Hardware and H&M and restaurants such as Auld Dubliner Irish Pub, there are also many other activities to partake in at this shopping center. There's a movie theater, giant Ferris wheel, and a comedy club called the Long Beach Laugh Factory. The Cyclone Bridge pays homage to the site's former amusement park and connects the Pike with Rainbow Harbor. Long Beach Transit provides seasonal transportation between waterfront attractions via the Aquabus and the larger Aqualink. It's a fun way to get from the Aquarium of the Pacific or Shoreline Village to the Queen Mary, Belmont Pier, or the Alamitos Bay Marina. Utilizing public transit is also an inexpensive way to go for a boat ride, even if you don't plan on getting off. The Earl Burns Miller Japanese Garden at California State University, Long Beach is a beautiful 1.3-acre garden retreat with a koi pond that's free and open to the public​ and will melt any stresses away. If you're interested in the history of the city by the sea, the Historical Society of Long Beach operates a public gallery in Bixby Knolls, which is about five miles north of downtown. In addition to rotating exhibits from the historical archives and special themed exhibits that draw from community artifacts, they have a great selection of books on Long Beach and historic photos and postcards for sale. If you're visiting around Halloween, sign up for the cemetery tour, where actors tell the fascinating stories of real people interred in Sunnyside Cemeteries. Although you will have to leave Long Beach, a day trip or weekend jaunt to Catalina Island is a popular excursion from the area. The Catalina Express runs ferry service from Long Beach and San Pedro, and there are plenty of activities to do when you land on the island including hiking the Trans-Catalina Trail, visiting the botanical gardens, and going on a thrilling undersea expedition in a semi-submersible boat. Whether you're serious about learning to fly an airplane or just want to give it a whirl, Pacific Air Flight School is a great place to take a small plane or helicopter flying lesson. Or, if you'd rather sit back and enjoy the ride, there are several different helicopter tour companies that offer tours departing from the Long Beach Airport, including some that fly over Hollywood. El Dorado Park Nature Center is a wildlife habitat that offers biking and hiking trails, fishing ponds, paddle boats, an archery field, and train rides aboard the El Dorado Express. The Long Beach Antique Market is a monthly, outdoor flea market with more than 800 antiques and collectibles vendors from around the country. It takes place on the third Sunday of the month with a bonus market whenever there's a fifth Sunday in a month. The Bembridge House is a historic Victorian home in Drake Park. The house was built in 1906 and is operated by Long Beach Heritage, which conducts tours about once a week. The house is significant for the architectural integrity of both the exterior and interior, which includes a great deal of opulent detail.